This is the next post in my series discussing how the Clark County Family Court handles issues when two parents cannot agree on parenting decisions. My last post explained how a child may get the opportunity to choose how they wish to be raised once they are older. 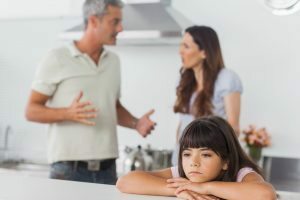 In this post I am seeking to provide parents tips on how to manage differences effectively and avoid both getting tangled up in the Court system and alienating one’s child. When a couple separates it is understandable that they may have parenting differences that are hard to reconcile – after all, they were not able to make their union as a couple work for a reason. But it is also important to remember that your former partner is your child’s parent too and that they have the right to weigh in on parenting decisions- even if you don’t like them. In order to help parents decide what issues are worth fighting over, and what they need to let go, here are some tips. Ask yourself if your child is being objectively harmed. Parents may have strong feelings about issues such as discipline, what their child eats, how they dress, etc. It can be maddening if your co-parent doesn’t hold up your ‘rules’ during their visitation time. But if their parenting style does not fall into the category of abuse or neglect then a Judge is probably not going to tell the other parent what their parenting values should be. Your child may be a more well rounded person if they are exposed to different ways of life. Perhaps you and your ex have different cultural values or differ on religious views. Or maybe your personalities are just very different. In the long run your child may grow up to be more flexible, more socially savvy, more compassionate, and more well rounded if they are exposed to a variety of living environments. Having a loving relationship with both parents has more of an impact on child wellness than almost anything else. Your ex may drive you crazy but if they are a loving and attentive parent to your child then that will count for a lot when it comes to their emotional well being. This is why Courts strive prefer joint custody when at all possible- Judges know that children benefit from a close relationship with both parents, even when those parents aren’t perfect. Co-parenting with an ex is never easy, especially when the reasons why you broke up in the first place are still fresh. However, if you can keep these points in mind, it may help keep perspective and save you from running to Court rather than working out arguments privately. Contact my office today to speak with a Las Vegas child custody attorney.